I did a keychain with the opposite configuration, having the zebrawood in the center. 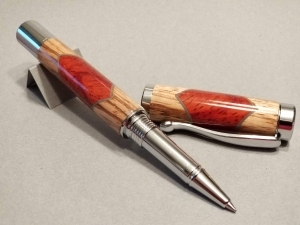 I decided to switch it up for the pen, wasn't sure how it would come out but pleased with the result. It's also the first time I've used paper, the separator is 3 layers of gray card stock. Gives it an interesting effect. The blank was constructed with Gorilla wood glue and finished with 6 coats of medium CA. The wood combinations look nice to me and the cardstock also worked well. You also did a great job of centering each blank between the ends - while easy to manage, is often overlooked but makes a very nice visual appearance. Interesting, looks nice. Don't see paper used often with segmenting. I think that it tends to delaminate pretty easy -- I've seen paper used where pieces are only meant to be held together temporarily. As Marks already said, the color combination is nice, well done! I like it ... very nice !! The woods look good together, nice work on the Atrax!